OK, only one of those is true, and it’s not the last one. At the University of Waterloo Keysigning Party last fall, some of the people signing my key were younger than the key they were signing! At the keysigning I was having a discussion with someone about key lengths. In particular, choosing 4096 bits instead of 2048. I was reading that GnuPG has a limit of 4096 bits, but that 4096 should be enough for all time to come. I’ve read online that GnuPG does actually support larger key sizes but that there is a const in the source code limiting it to 4096. The reasons for doing so are supposedly speed, 4096 would be very slow to generate and use, and comparability with other implementations that may not support larger keys. Personally I think it’s an inevitability that this will be increased in time but we’re not there yet. In 1996 when I started with PGP a 1024 bit key was considered adequate, by 1999 a 2048 bit key was still considered large. Consider Moore’s Law: every 18 months computing capacity doubles and costs halve. I’m not sure if that means that over 18 months x flops increases to 2x flops at the same price, or that in 18 months the cost of x flops is half of today’s cost, or if it means that in 18 months the cost of 2x flops will be half the cost of x flops today. If the latter, then today’s x flops/$ is x/4 flops/$ in 18 months. That factor of four is an increase of two bits every 18 months, or four bits every 3 years. So, the cost in 1996 to brute-force crack a 1024 bit key is the same as the cost in 1999 to crack a 1028 bit key. And in 2014, 18 years later, it’s the same cost as cracking a 1048 bit key (an additional 24 bits). An increase in key size from 1024 bits to 2048 bits buys an additional 768 years of Moore’s Law. And going from 2048 bits to 4096 bits buys an additional 1536 years of Moore’s Law. Is Moore’s Law overestimating the cost of cracking keys? 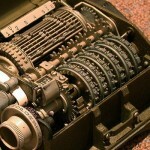 Are there fundamental advances in math that have dropped the cost of cracking 1024 bit keys to near-zero? What’s the economic justification for crippling keysizes in GnuPG, anyway? –Bob, who is not trolling but really wants to know. Day 57 / 365 – refrigerator by Jason Rogers is used under a CC BY license. This post is based on a message to the KWCrypto Mailing List. Cryptoparty like it’s 31 December 1983! At the next KWLUG meeting on Monday, 2 December 2013 I’ll be demonstrating how to do e-mail encryption with Thunderbird and Enigmail. If you’ve never used e-mail encryption before then bring a laptop, and we’ll create keys and learn how to use them. We’ll save the lesson with pointy sticks for another day. This is a great way to expand your Web Of Trust to include people whose keys you might not otherwise sign (because you don’t know them very well, or they only have ID issued by an authority you don’t like). With all these introductions and vouchings the chance of someone misrepresenting their identity is vanishingly small, so you can trust that the key fingerprint they read is really associated with that person. To make this process go smoothly I’d like to have a printout of all the participants’ keyIDs, UserIDs, and key fingerprints, which I’ll distribute at the keysigning. That way you can just check off each name/keyID/fingerprint as people read them, and then sign their keys later at your leisure. 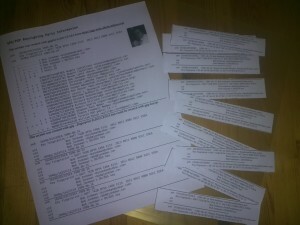 But to get that printout I’ll need the public key of anyone who would like to participate in the keysigning. and send that file 0xYOURKEYID-public-key-for-YOURNAME.pgp to me (substitute your actual keyID and actual name as needed). Of course, I’d prefer signed, encrypted e-mail, but public keys are public (so encryption isn’t necessary), and public keys should already be self-signed anyway. Unfortunately, if you’re creating your keys for the first time at the meeting you won’t be able to send me anything now. You can still participate in the vouching process, and we’ll have an informal keysigning after the formal keysigning, where all you need to do is read your fingerprint straight from your computer and those people who already know you can sign your key. I’m still working on the procedures for the formal keysigning; you can see the work in progress (and contribute!) on the Formal Keysigning page on the Wiki. Thanx, and hope to see you on Monday, 2 December 2013! –Bob, who is the Keymaster. Who will be the Gatekeeper? The Cryptoparty keypair logo from the Cryptoparty Artwork repository on GitHub is available in the Public Domain. The months of October and November are shaping up to have some great lectures and presentations on cryptography, security and privacy. Yesterday started off with an informal keysigning at the KWLUG meeting. The presentation was on the Scratch programming environment, nothing to do with GnuPG/PGP or cryptography. But a few of us exchanged little slips of paper with our key fingerprints, verified that the name with the fingerprint matched the person we knew, signed the keys, and so improved our standing in the Web of Trust. I hope that this becomes a regular part of all KWLUG meetings. The more people that participate, the more confident we can be about the validity of keys we may not have verified ourselves. 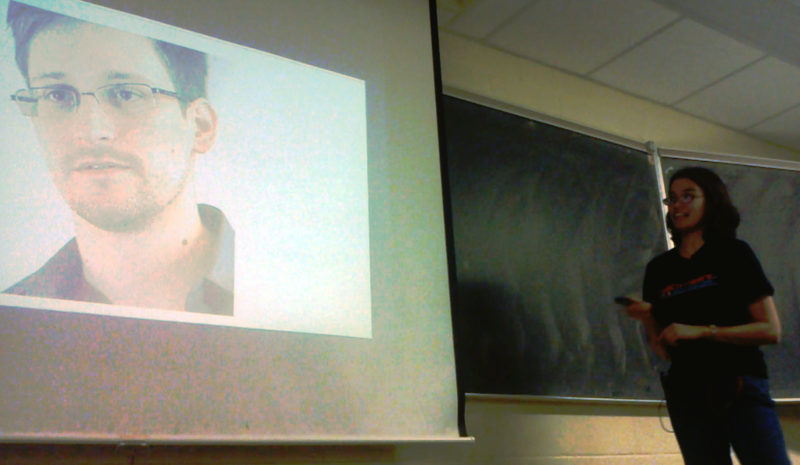 Today I attended the first UofW CSClub lecture on Security and Privacy by Sarah Harvey. If you’ve been following the news about the Snowden revelations you’ll know why security and privacy is important. The room was full of computer science, math and cryptography students, so the discussions were deep and technical. There are more CSClub lectures scheduled, check the schedule on the CSClub site. I’ve volunteered to do a presentation on Encrypting E-mail with GnuPG, Thunderbird and Enigmail, followed by a formal keysigning. I’m developing the presentation notes and keysigning procedure on the KWCrypto Interest Group Wiki that was set up after the Kwartzlab keysigning party last year. Please join me on the Wiki and the mailing list — I’d appreciate the help. Keysigning Materials picture taken by Bob Jonkman and released under a Creative Commons — Attribution — CC BY license. Picture of Sarah Harvey taken by Laurel L. Russwurm and used under a Creative Commons — Attribution — CC BY license. Some ID would also be a good idea, for those who do not already know you. If people don’t know you, then they shouldn’t be signing your key. If you don’t know someone, then you shouldn’t be signing their key. Using ID of any sort is assigning trust by proxy to an “authority”. You’re no longer vouching for a person based on your own knowledge, but relying on the “authority” to provide that trust. If you’re going to rely on third-party authorities you might as well revert to a hierarchical PKI and pay lots of money to a certificate authority to assign levels of trust for you. The point of the keysigning is to associate a key value with a real person, with no opportunity for a Man in the Middle attack . It is not to verify name, address and permission to drive in Ontario. When I sign your key it is not because the government says that you’re allowed to drive under your name, but I sign your key because I believe that you’re the same guy who drinks Jagermeister and hacks on Blackberries and hangs out at the Syrup Festival. It is based on my personal knowledge of you, and my trust in your claim that you own the GPG key with fingerprint D2CCE5EA . The Web of Trust extends this, so that since I trust your identity and judgment, I’m also likely to grant some level of trust to the people you trust. After a successful keysigning party then I’m going to trust many more people because they’re all trusted by people I trust. And I’ll be trusted by more people, because they trust the people who have signed my key. I’ve written complete instructions for holding a Formal Keysigning. This FAQ is copyright © 2001 by Wouter Slegers. It may be distributed freely in online electronic form, provided the copyright notice is left intact. Since this FAQ is always available from USENET and the PGP network, there should be no problems getting access to it. However mirrors with outdated versions can confuse the users, so I request you not to mirror this FAQ elsewhere. Q: What’s a key signing party? A: A key signing party is a get-together with various other users of PGP for the purpose of meeting and signing keys. This helps to extend the web of trust to a great degree, making it easier for you to find one or more trusted paths to someone whose public key you didn’t have. Kevin Herron has an example of a keysigning party announcement page . A: Though the idea is simple, actually doing it is a bit complex, because you don’t want to compromise other people’s private keys or spread viruses (which is a risk whenever floppies are swapped willy-nilly). Usually, these parties involve meeting everyone at the party, verifying their identity and getting key fingerprints from them, and signing their key at home. At the meeting, distribute the printouts, and provide a site to retrieve the keyring (an ftp site works, or you can make floppy copies, or whatever — it doesn’t matter). When you are all in the room, each person stands up, and people vouch for this person (e.g., “Yes, this really is Derek Atkins — I went to school with him for 6 years, and lived with him for 2”). To save load on the keyservers, you can optionally send all signatures to the original person, who can collate them again into a single keyring and propagate that single keyring to the keyservers and to each individual. I’m going to have to put my key signature where my mouth is. Hopefully there will be another key signing party soon, for which I will be more prepared. Yes, it is still possible to have a meatspace MitM attack if you’re signing keys for people you don’t know and relying on ID. If you’ve never met me before then it is possible that someone mugs me in the parking lot, takes my ID and wears my goofy hat. If you don’t know me you would never be able to tell the difference, and you’d be signing a key for the wrong person. Although that’s really my PGP key, so as not to divulge the identity of innocent and unsuspecting Key Signing Party Organizers. Sadly, Kevin Herron makes the same mistake of requiring "Positive picture ID". Please ignore that part. 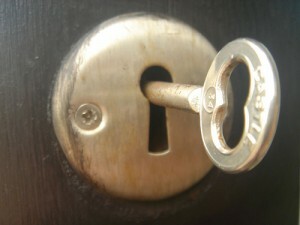 Key by Quasimondo is used under a Creative Commons by-nc license.